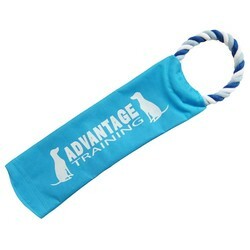 Insert an empty water bottle with tight cap into toy polyester/cotton sleeve and pet will be entertained making “crunchy” noise when biting down. Heavy duty ring attached for tug-o-war fun. Price includes a screen printed, 1-color on one location imprint. Size: 17" x 5" x 2-1/2"
Imprint Area: 9" x 2-1/2"
Packaging: Bulk. Qty/box: 200. Weight/box: 26 lbs. Box Size: 24" x 14" x 15"